As we start to wrestle control of our still rapidly growing Digital Underwater Camera rental business, it feels like it’s time to get back to exploring the region a little. 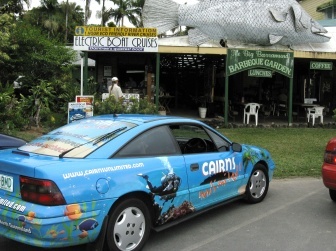 Although we have camera deliveries in Cairns every evening and most mornings, there are plenty of terrific places that we can visit as a day trip from the city. Last weekend it was the wonderful Atherton Tablelands, one of my personal favourite areas of Tropical North Queensland because of its diversity and the authentic unspoilt Aussie charm of the towns dotted through the Tablelands. This weekend it was time to head north, to cross the mighty Daintree River for the first time since we holidayed here two and a half years ago. Our first stop was Port Douglas. With its unhurried holiday atmosphere, this is always a pleasant experience. 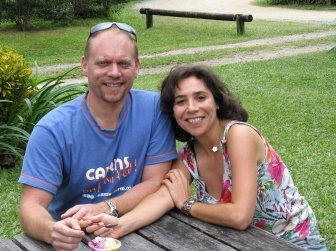 We enjoyed a couple of huge homemade muffins and a coffee in one of the main street’s many eateries before venturing north through the came fields that surround Mossman to the sleepy little village of Daintree, where I embarrassed Maria by raucously spinning the wheels (accidentally) of the cairnsunlimitedmobile in the quiet main street. The main activity in Daintree is crocodiles; more specifically spotting them on one of the many river cruises available. 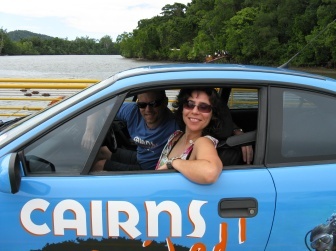 Some of the cruises depart from Daintree Village, some from just outside town, and many from just before the ferry crossing. 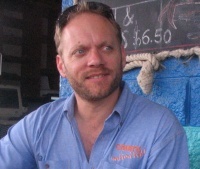 There is no bridge across the wide Daintree River, and the vehicle ferry operates from 6:00am till midnight, continually passing from bank to bank every few minutes. North of the river, it’s a slow drive through the rainforest; a winding, narrow road designed for sightseeing rather than ‘getting there’. It was due to the leisurely pace that we were able to notice something staring at us from the thick roadside foliage. We stopped to investigate, and the large animal watched us intently, pacing slowly from side to side to view us from the shelter of the shrubbery. 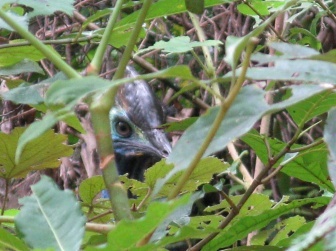 It was difficult to get a clear photo, but after a while curiosity got the better of it, and the large cassowary emerged cautiously from the scrub. It was as it approached us that I remembered this is the species which holds the title of ‘deadliest bird in the world’. One look at its powerful legs, and Maria and I decided the photo opportunities would be just as good from the safety of our car. We beat a hasty retreat. 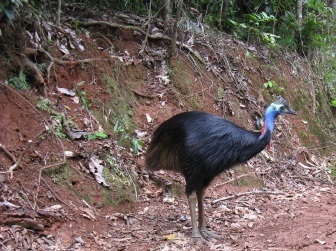 This was the first time I had ever seen a cassowary in the wild, but we were to be treated to two more close encounters with the large flightless birds before we reached the end of the sealed road at Cape Tribulation. 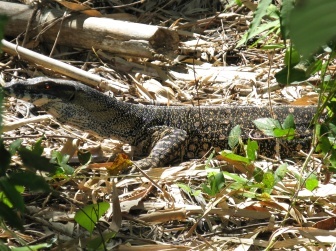 In fact, it was quite a day for wildlife; upon arrival in the village, we had to slow to allow a large goanna to cross the road. The 1.5metre long lizard quickly sought camouflage in the long grass, but stayed still long enough for me to get a good photo. The beach at Cape Tribulation really gives you a sense of isolation; it is long and wide and backed by rainforest clad mountain ranges with no signs of human influence as far as the eye can see… and usually it is all but deserted. But not this time. 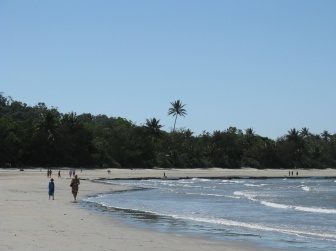 Being the busy tourist season – and local school holidays to boot – this two or three kilometre stretch of beach was ‘crowded’ with over a dozen people! I was ready for lunch, and in fact had a craving for a grilled fillet of barramundi. But Maria was still full from the football sized muffins we shared for breakfast. Still, I knew she would be tempted by icecream. 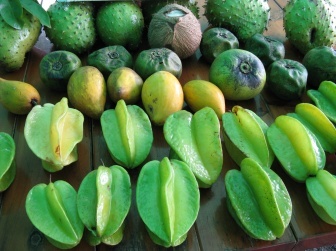 We sampled four flavours of local homemade icecream; yellow sapote, wattleseed, blueberry, and macadamia. But time flies when you’re having fun, and it was time to return and prepare the cameras for the evenings deliveries. Another successful road trip!